Over the Counter Erectile Dysfunction Aids! Many herbs have been promoted as erectile dysfunction aids, but in reality, very few work. Ginko has shown a bit of promise for men who experience ED as a result of taking antidepressant medications. In one study done with 60 men about half showed marked improvement in the ability to achieve an erection after 6 months of treatment with ginko. Two other ED studies found than ginko was no better than a placebo. L Arginine is a precursor of nitric oxide, the vasodilator needed to achieve an erection. When combined with pycnogenol, L-arginine has proven to be effective in treating erectile dysfunction. This supplement gets a bad rap, because most people use to much of it. Take the right amount, and you won't have a problem with side effects. In my opinion, yohimbe is the most effective over the counter erectile dysfunction aids available. The supplement contained a handful of vitamins, and a few herbal extracts. I'd bet my life that they don't work! Because there is no evidence that a vitamin deficiency of any kind causes causes or contributes to erectile dysfunction. 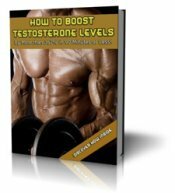 If you are deficient in zinc, supplementing with this mineral will very likely give you a nice boost in testosterone levels. For best results take with B6 and magnesium. You can buy these together as a free standing ZMA Supplement.